Along with times changing and urban space juxtaposition, open teaching has been gradually taking place of traditional indoctrinating teaching. Such open-ended teaching requires not only indoor classrooms, but also outdoor teaching places. Based on the situation of limited urban space, unique regional culture as well as sundry education environmental requirement, how to make a school meets all the requirements of a new era is a question now. 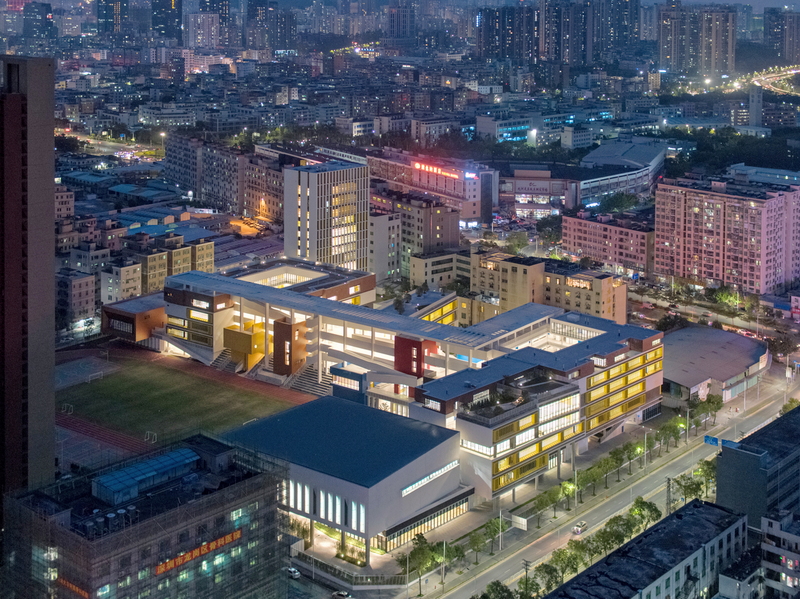 Located in the new area of Longgang Town, Longyuan School affiliated to Central China Normal University is a nine-year comprehensive campus that meets functional needs of 3,360 students in 72 classes, mainly serving the surrounding residential people. 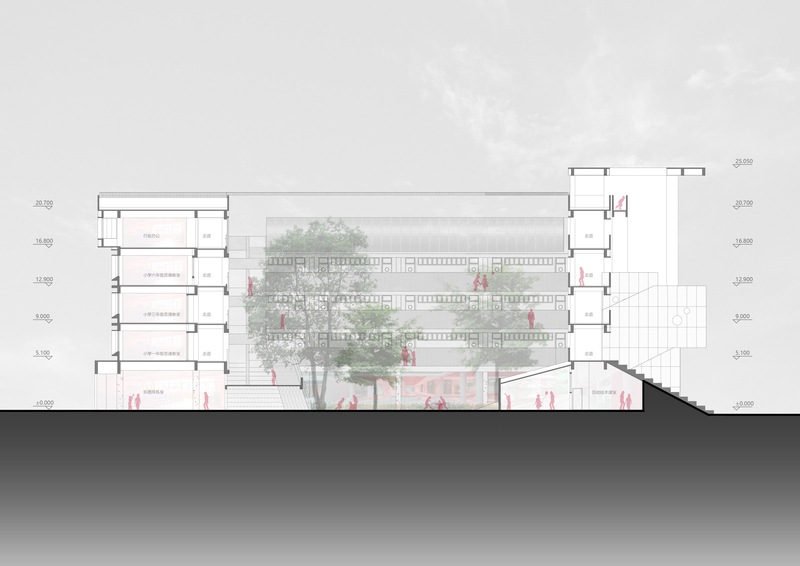 The design of the project is based on the principle of ‘creating a nature-friendly open teaching environment’. 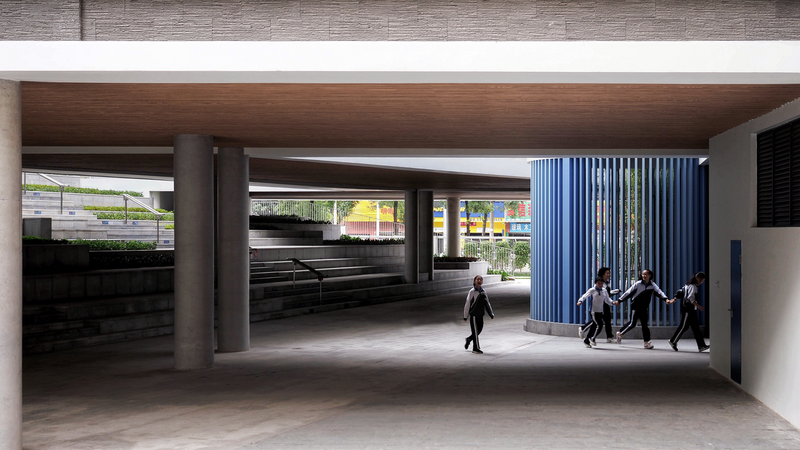 Inspired by the combination of corridors and alleys in traditional Chinese architecture and based on the principle of openness and flexibility, colorful outdoor learning, living and interactive space are created through the full use of space. Architects bring an unique green valley in the corner of urban high buildings. Unlike common school, this is an unconventional school with a plot ratio of 1.24. In the case of such a narrow space, how to lay out the teaching space to meet the needs of compatibility of traditional teaching and open teaching is a major design challenge. 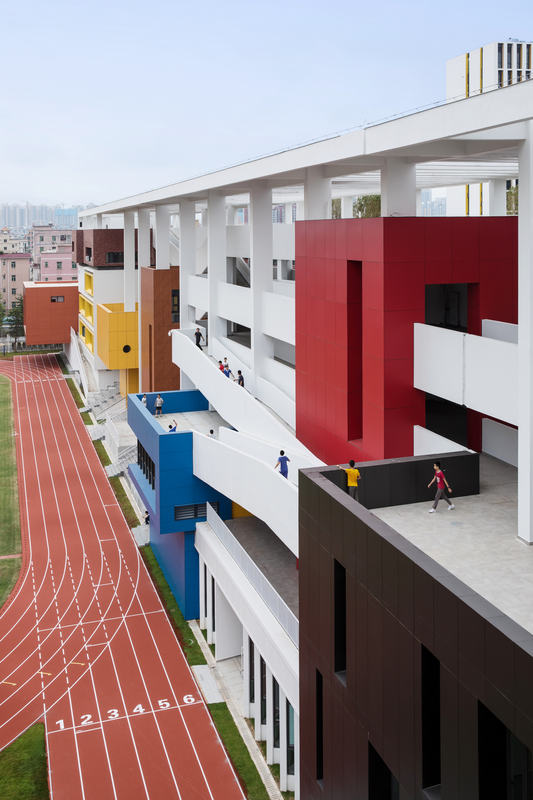 At the beginning of project, design team studied the teaching content, teaching methods, psychological characteristics and learning pressure of primary and middle schools respectively, finding that the imaginative primary school students are more suitable for diverse spaces and playful places, while the self-conscious gradually matured middle school students prefer quiet places, independent spaces for group discussions and exercise on the court. 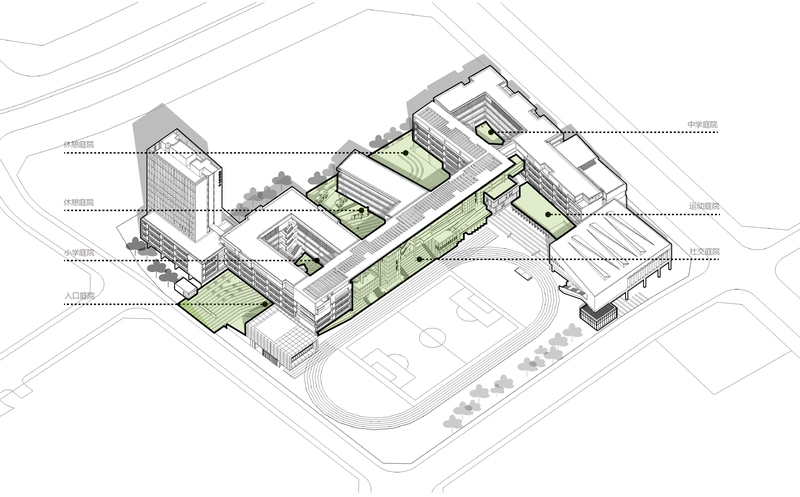 Based on demand, Longyuan School has a L-shaped layout in architecture plan. 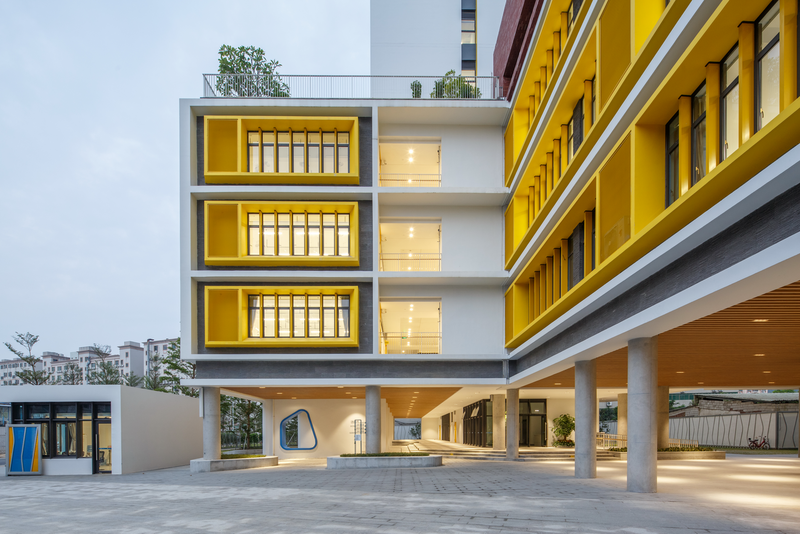 On one hand, similar teaching units are placed relatively concentratedly, ensuring appropriate lighting condition in close distance and forming courtyards with different style. 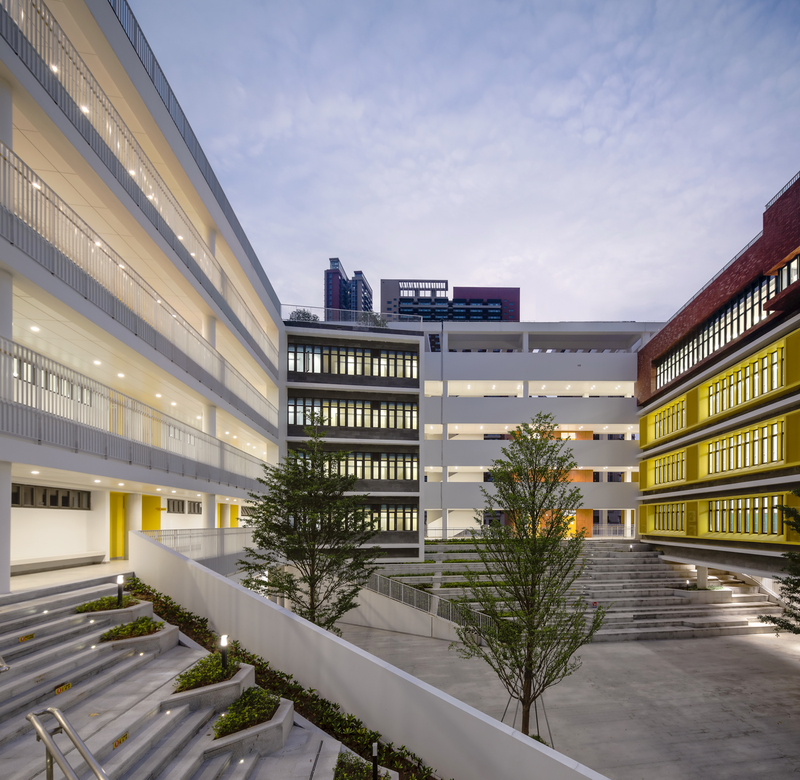 The courtyard is not directly landed, but placed on a splendid green slope to create a garden-like campus environment and ample activities. 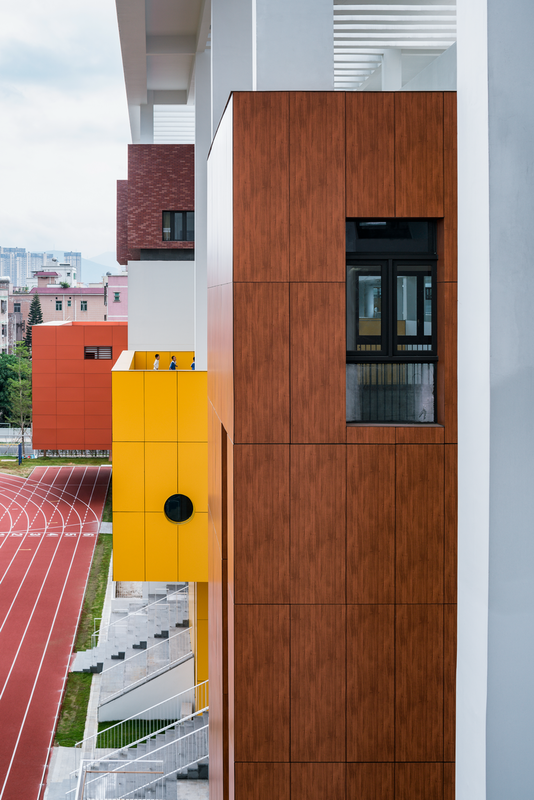 The indoor sports arena is placed next to the outdoor sports field, forming a clear division of active and quiet with the school's teaching area. The administrative office building is placed at the entrance to facilitate the management of the traffic flow. Canteen is placed in the southwest corner of the site to facilitate logistics and transportation. It is also following Shenzhen's leading wind direction, which is easy for the odor to spread out. 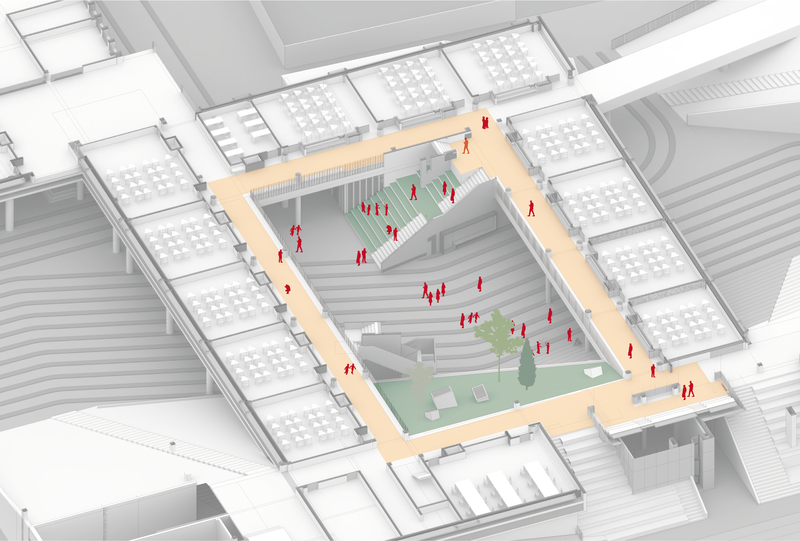 As partition between teaching area and sports area, the social corridor runs through the whole campus space like a "Dreamy Passageway". 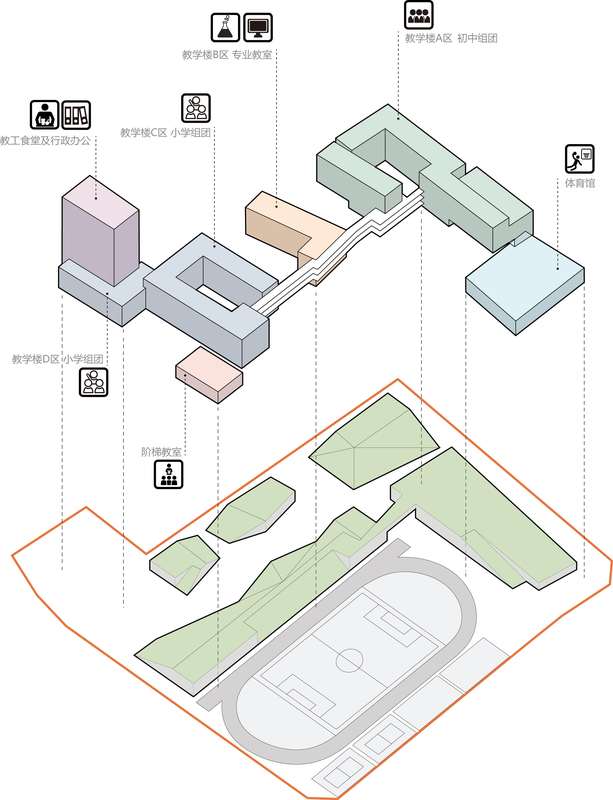 Five different color mass of "Golden Forum", "Wooden Stage", "Water Sound Room", "Fire Painting Pavilion" and "Earth Workshop" are connected with corridors through stairs and ramps. 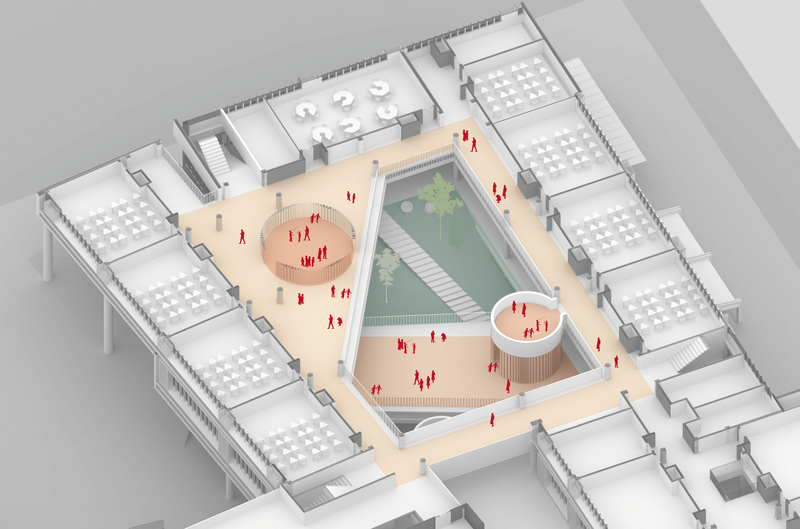 At the same time, a lot of diverse communication spaces such as platforms and staircase spaces are added into the corridors. 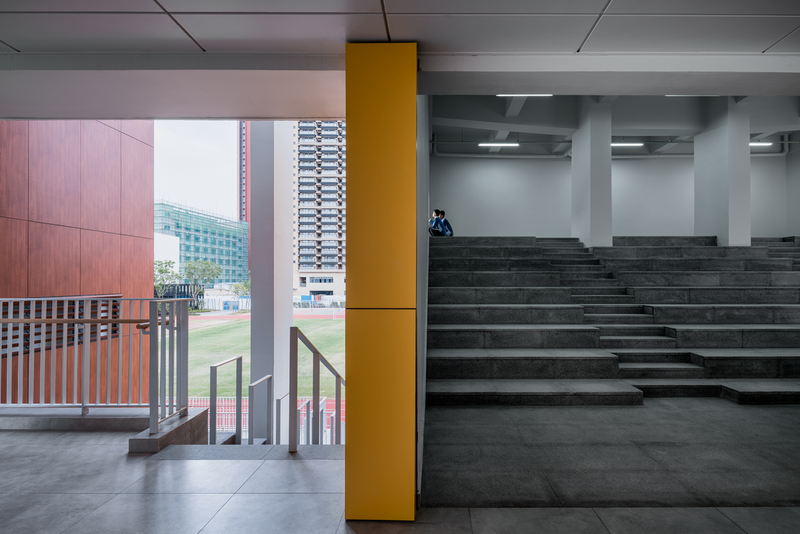 This enriches the corridors space morphology and also reduces the interference of the stadium to the teaching area. Children stroll, play, meet, communicate and discuss here, making learning a fun way of life. 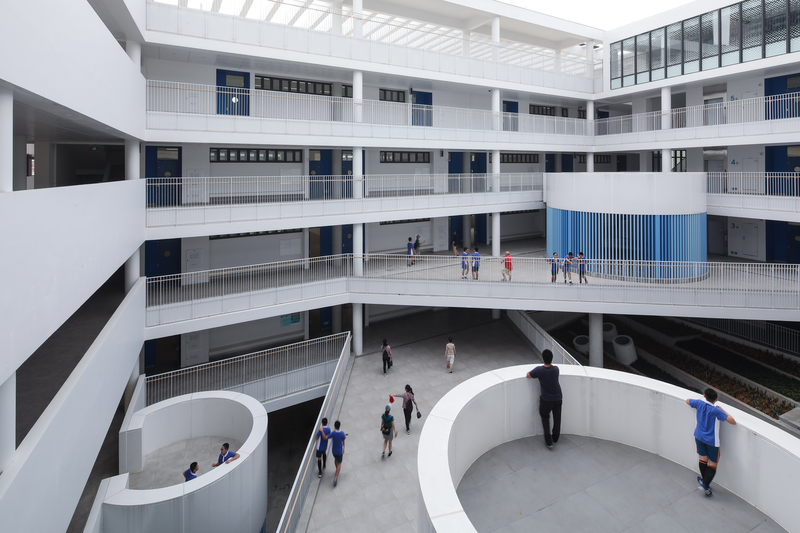 The main spatial layout of Longyuan School is divided into primary school teaching building, middle school teaching building, lecture theater, corridor area, gymnasium, staff dormitory building and canteen. 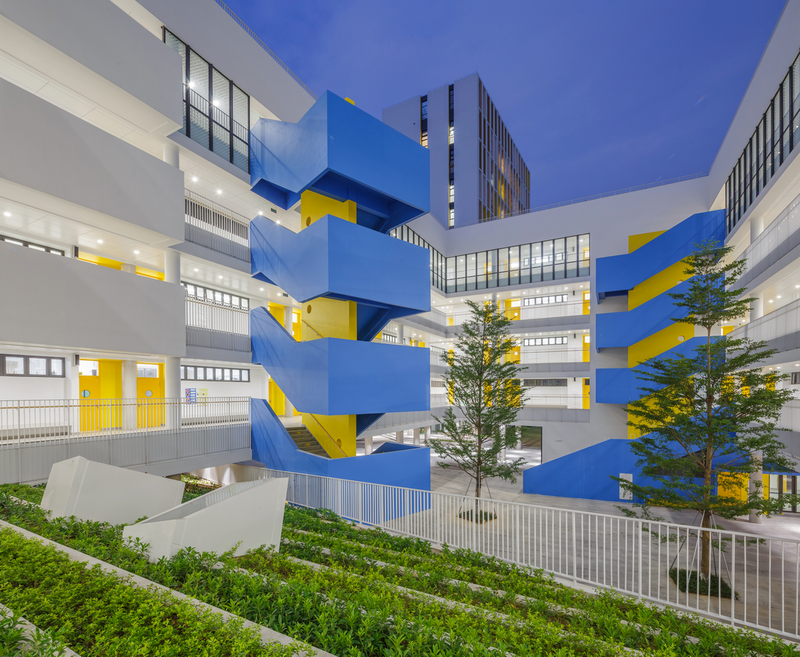 Different functional areas connect with each other through steps, ramps, lanes, corridors and courtyards, creating an interactive teaching system with functional space that do not interfere with each other but conveniently connected. The teaching room is placed in a quiet inner area which is divided into aboveground part and the landscape part functionally. 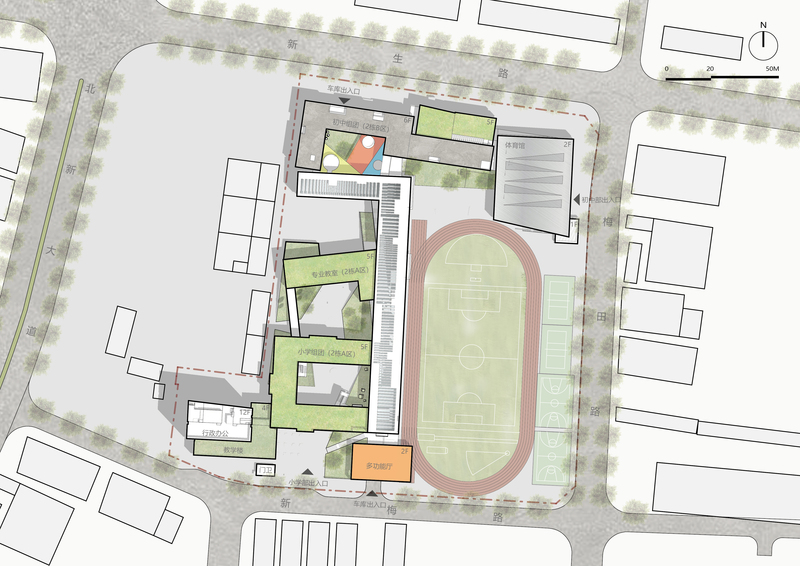 The aboveground part is the conventional classrooms. Primary and middle schools are located on the south and north sides of the teaching area. They have separate entrances and pedestrian streamlines. The specialized classrooms are set between the primary school and middle school, which is convenient for the arrival of students of different grades. 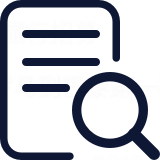 At the same time, it conforms to the idea of sharing hardware and software resources of nine-year school. 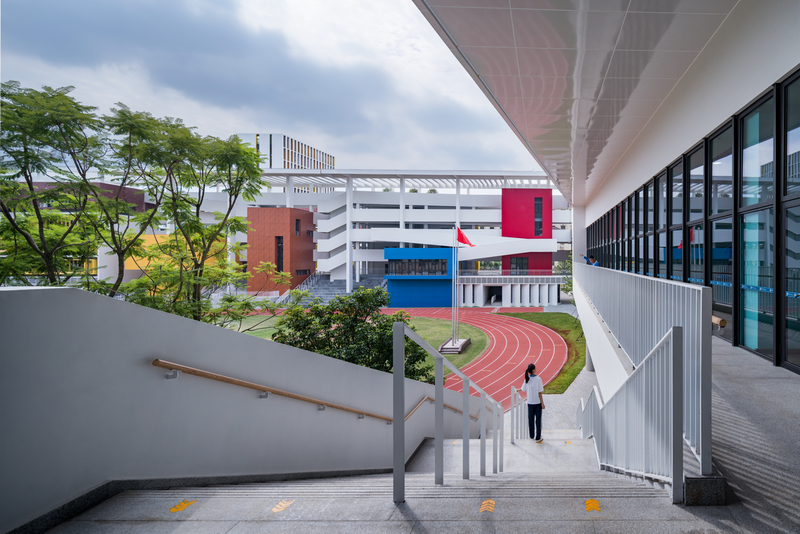 The landscape part is a collection of personalized teaching space, including music classroom, art classroom, dance classroom, gymnastics room and indoor sports arena. 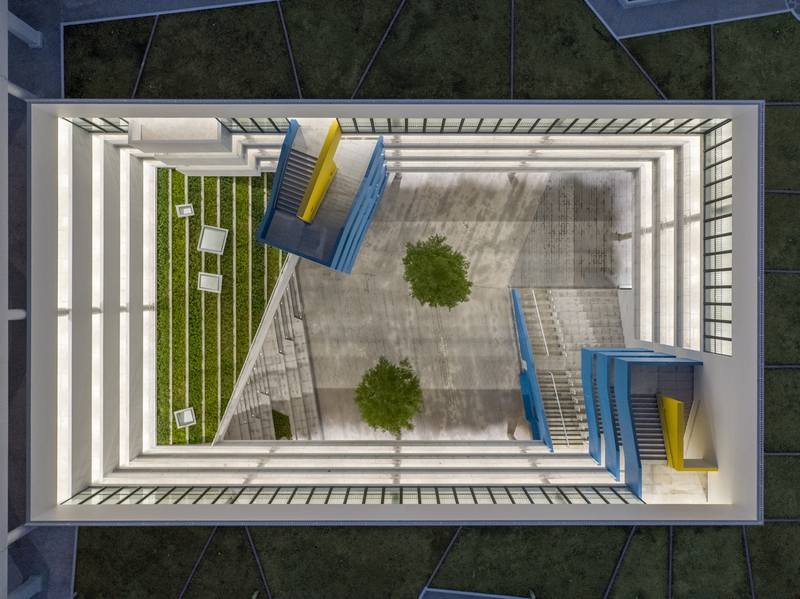 Landscape design closely links the overhead courtyard on the first floor with the platform on the second floor. The undulating grassland slopes and outdoor platforms form a rich and interesting public space system, which provides a suitable place for various open and exploratory learning methods, so that children can wander in the green hill garden with undulating ground and learn in nature environment. 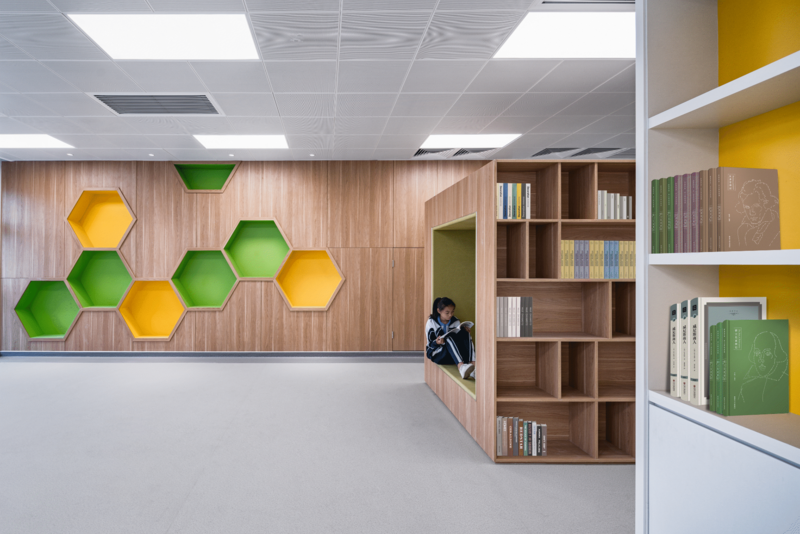 Kids in primary school prefer more lively and diverse space forms. 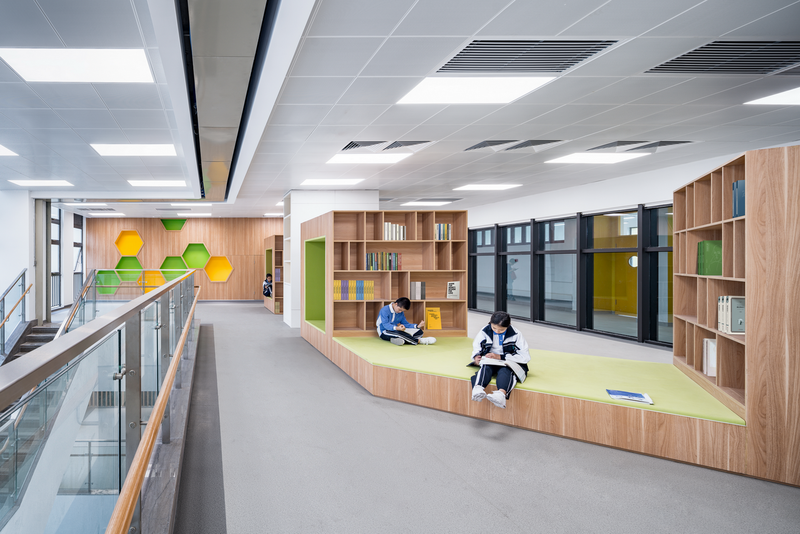 Instead of using traditional symbolic and concretization design techniques for children, designers use multi-form space layout on the overhead floor of the entrance of primary school to form space tunnels like in fantasy scenes. 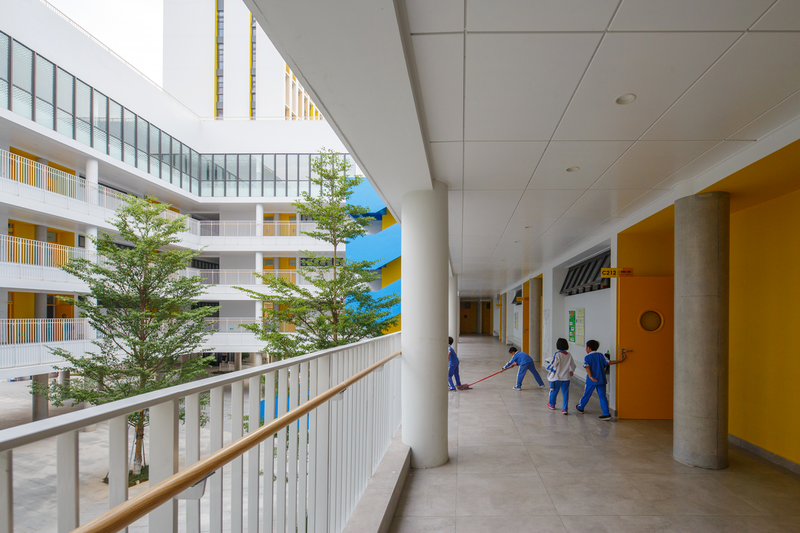 They really treat architectural space as a playground for children to play and stimulate children's playfulness. 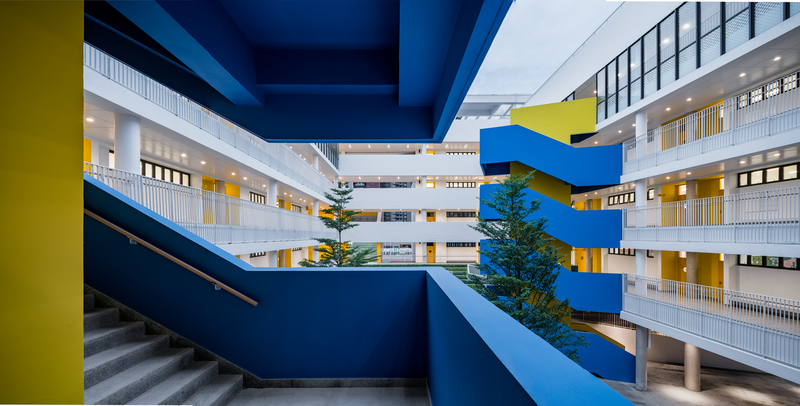 The corridor uses a large area of blue which represents "origin" and "fantasy", and matches with the yellow tone of the school as a whole. It is more friendly and interesting. The quiet and relaxing atmosphere forms a dynamic contrast with the liveliness of children. 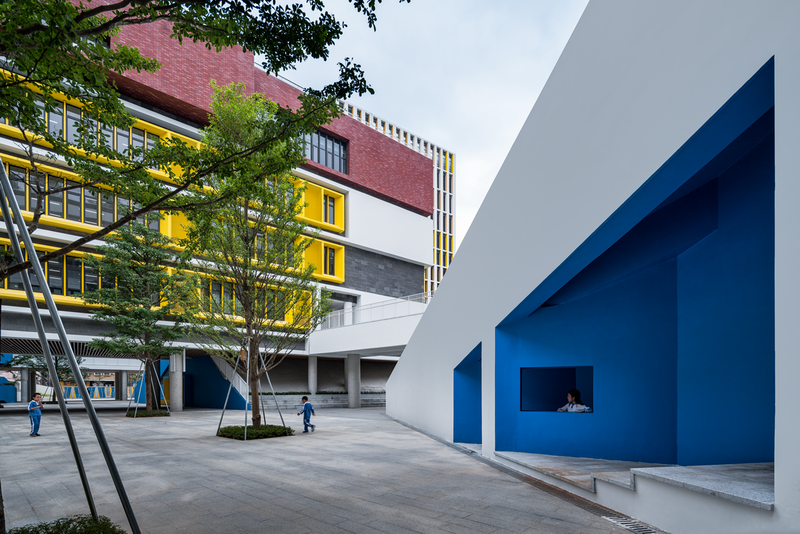 The architectural form of the middle school is a cuboid space enclosed by two teaching buildings and multilayer corridors. The outer side of the building maintains the overall yellow appearance of the school. The wall facing the atrium uses simple white to reflect strong sunlight. The light blue columns enclosing a small leisure space and terrace. 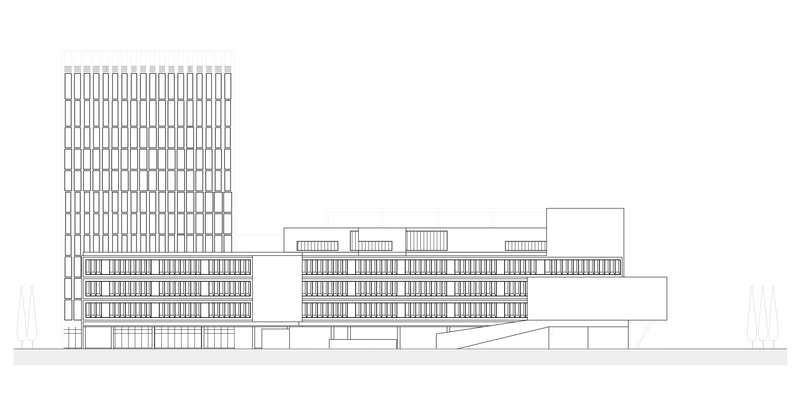 The multilayer terrace and overhead corridor connecting teaching buildings on both sides. 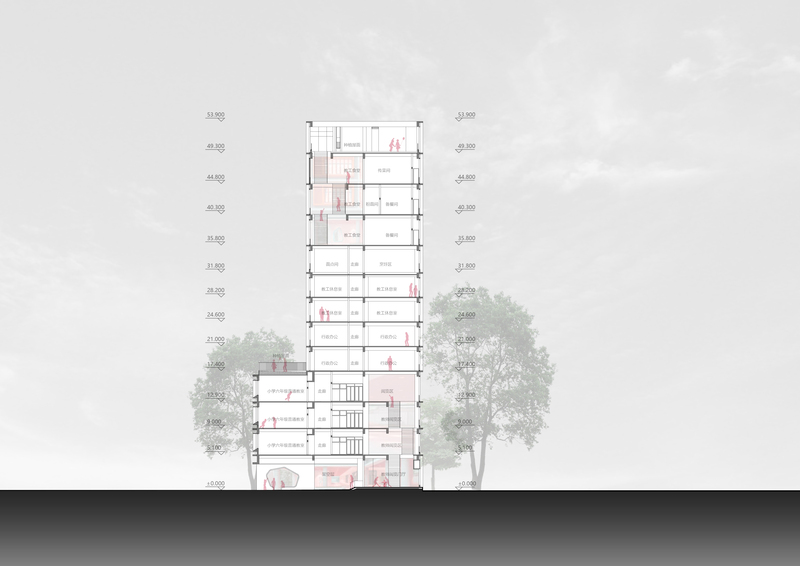 It not only meets space requirement for traffic, but also enlarges the size of public space. 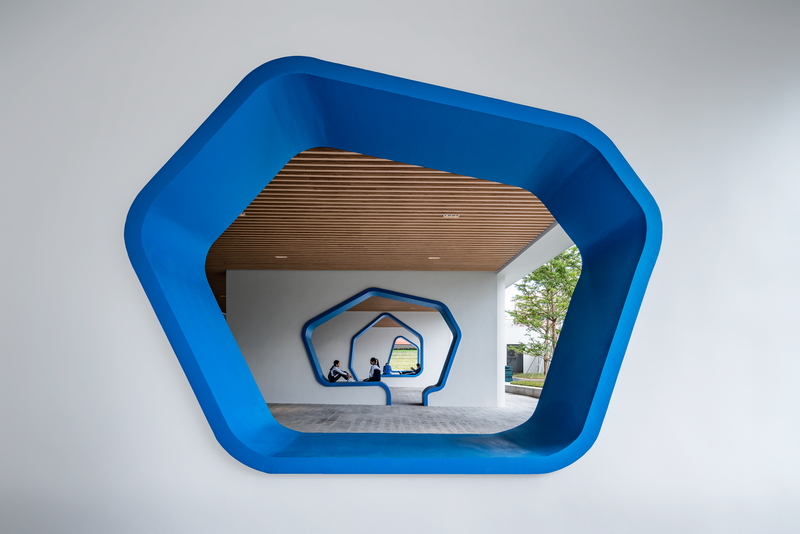 In addition, it creates more outdoor places for communication and interaction among different grades. 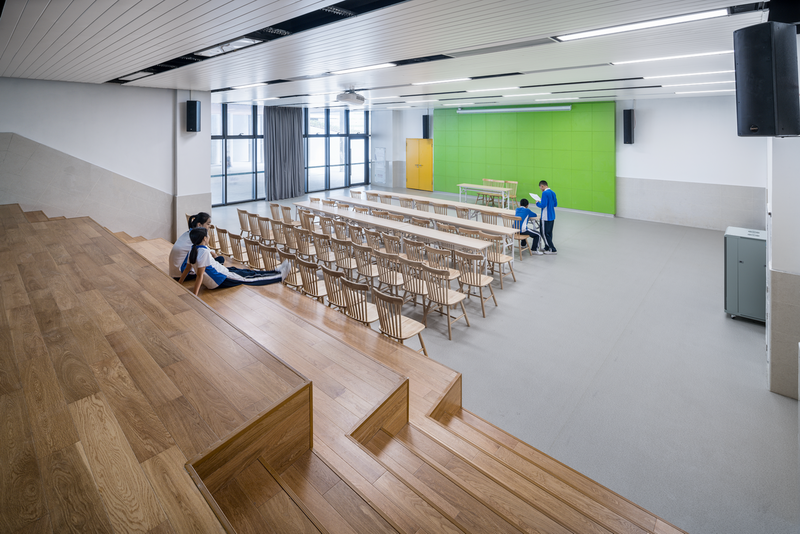 The wooden desks and chairs in the interest classroom are matched with wooden stairs, which is warm and cosy. 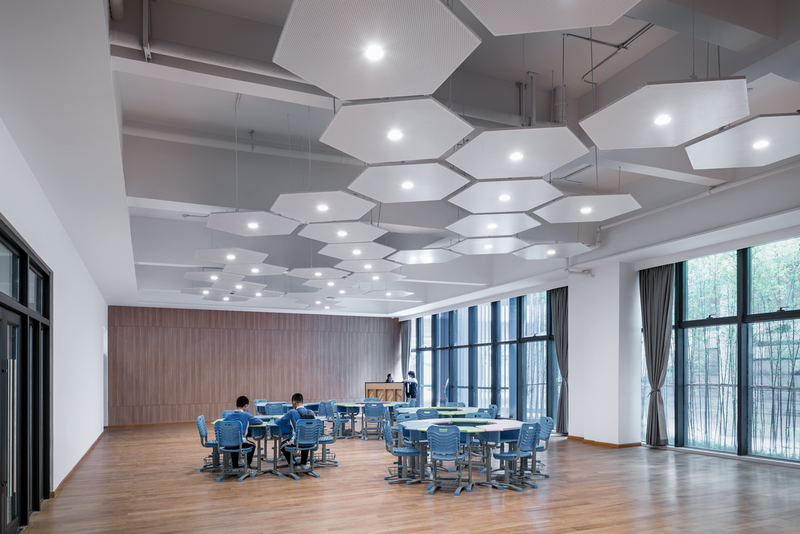 The aluminum sheets for the ceiling has joints, such design with sense of sequence increases sound absorption effect. The design of the library mainly utilizes the space layout of the original wall. Reading area is added to the oak bookshelf. Fabric art is used to create color jumping effect to excite the space atmosphere, and to ensure safety and produce visual impact. 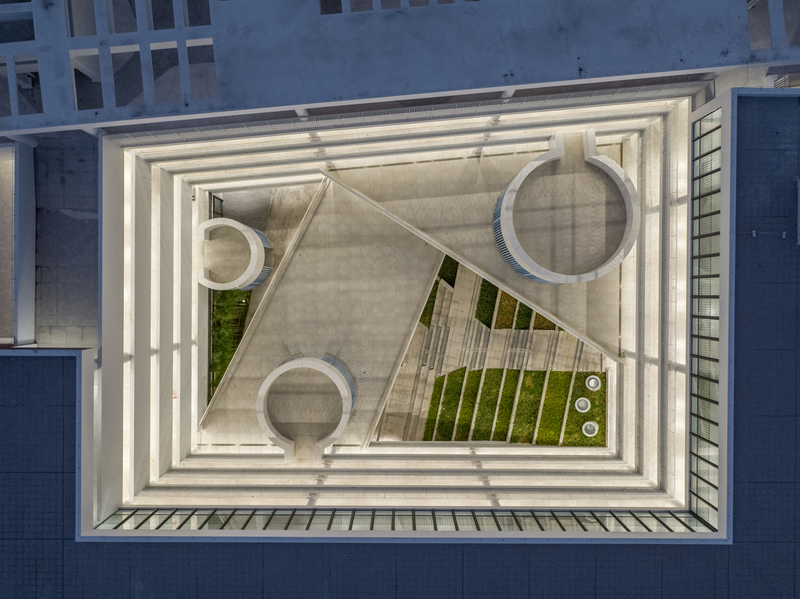 The administrative building lobby combines environmental friendly materials such as aluminum sheet, aluminum rectangular tube and artificial stone. Aluminum sheets are pierced into artistic patterns to highlight the theme of the background. 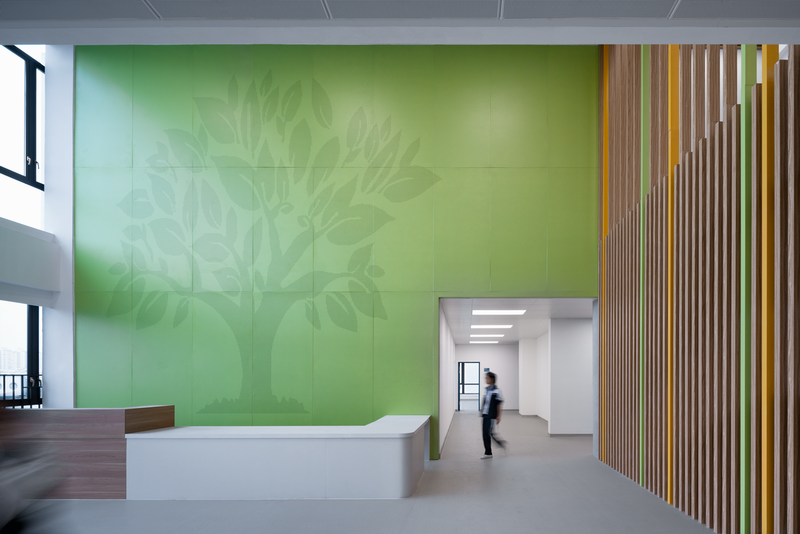 Large area of green are used, adding a fresh and vibrant atmosphere to the interior. The main users of a school are the children who will retain childhood memories in the school. 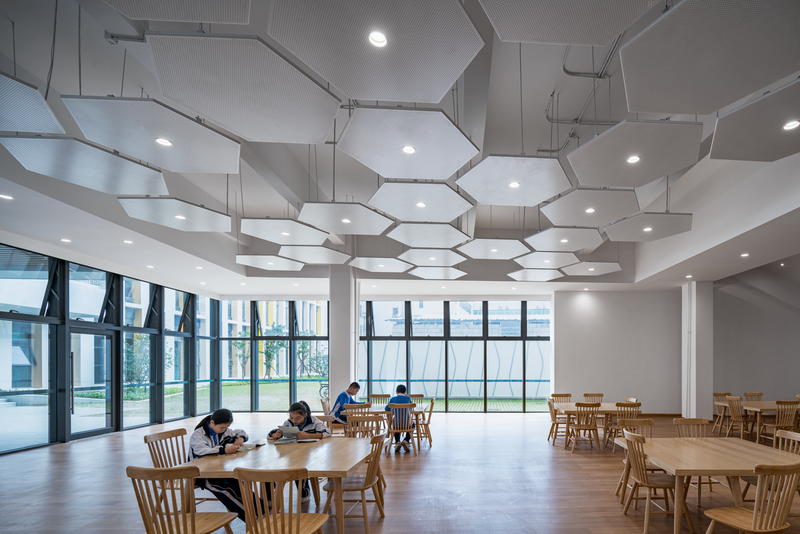 In the condition that the spacial form of traditional classroom can not be changed, from a more humanistic and creative point of view, the design of Langhong School creates more accessible "blank" space to stimulate student interaction and give children the happy space they should have at their age.